On a flat calm day this summer we encountered something very unexpected and amazing. 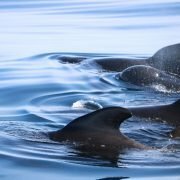 Just ten miles south of Salcombe we encountered a pod of Pilot Whales. Here’s a little edit. Take a look! The conditions were absolutely perfect. Glassy sea and no other boats in sight, just us. It was surreal. It was a huge pod. Wherever we looked there were fins and whales breaking surface. It’s hard to know why they were here. Their principal diet is squid, although they also eat cuttlefish, herring and other small fish when squid is unavailable. Maybe they had chanced on a shoal of herring, which are becoming increasingly common again off our south west coast. It was so unexpected, we weren’t ready for it, didn’t have filming equipment set up or anything. However the whales didn’t seem in a hurry to leave us. We got the equipment set up in record time, filming from the boat and the air with the Inspire drone. You can’t miss an opportunity like this. We spent about half an hour with them, trying to make the most of the moment and since we were not in a rush to get back anyway. The whales also had their young with them. Overall, It was a magical encounter which we would be incredibly lucky to ever experience again! After finally leaving the whales and continuing on towards Falmouth, something caught my eye disturbing the flat calm sea. Surely it couldn’t be…? Throttling back on Cecienne we were just in time to watch a huge leatherback turtle slowly submerging. You can occasionally see leatherbacks in the Irish Sea in the summer, feeding on jellyfish that swarm there each year. The water around us was full of jellyfish, so obviously this one had made a slight detour up Channel as it grazed on the swarm. 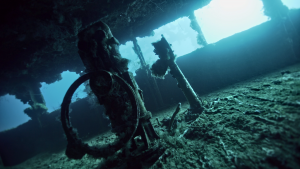 We’re in the very final stages of the edit of our latest underwater documentary “Truk Lagoon: Japan’s Pearl Harbour”. The online edit is booked at Films at 59 in Bristol in early December. But before that we have to film our expert historian Saul David, who’s commentary will knit together the film’s story. In addition to being Professor of Military History at The University Of Buckingham, Saul is a well respected author and broadcaster. His involvement will take the documentary to another level. Most “talking heads” in documentaries tend to be filmed in front of a bookshelf crammed with books.This is somehow meant to accentuate their wisdom. We wanted to do something different. Our first idea was to try and film on board one of the many decommissioned Royal Navy ships in harbours such as Plymouth or Portsmouth which allow public access. However the timescale involved in obtaining the necessary consents ruled that option out. 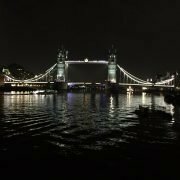 And then Saul came up with a suggestion – how about HMS Belfast? Moored on The Thames, close to Tower Bridge, HMS Belfast is one of London’s iconic sights. The ship is a must- see for any visitor to the city. But surely filming on her would be impossible for us? Fortunately she is owned not by the Royal Navy, but by The Imperial War Museum. Our email enquiry was promptly answered, and followed up by a phone call with the extremely helpful Jennifer Leatherby, Business Development Manager for the IWM. And the result – on Wednesday 21st November HMS Belfast is ours from 5pm onwards as our filming location. So the Shark Bay Films crew will have one of Britain’s most famous ships all to ourselves. Now that doesn’t happen often! 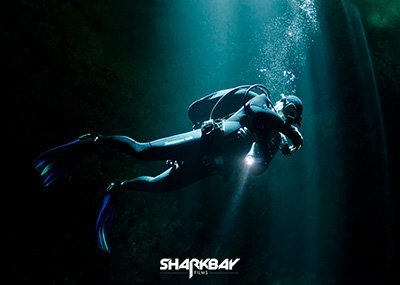 https://www.sharkbayfilms.co.uk/wp-content/uploads/IMG_5166.jpg 1224 1632 Shark Bay Films https://www.sharkbayfilms.co.uk/wp-content/uploads/Shark-Bay-logo-300x167.png Shark Bay Films2018-11-09 14:38:322019-01-22 12:19:26HMS Belfast!